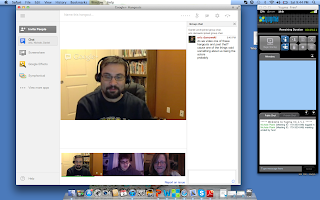 This blog post is to briefly describe how out web conference went for our Flipped Professional Development for CEP812. We used Google Hangouts for our web conference. I tried out Yugma and WebHuddle before our meeting and I really didn't find it as user friendly. I had done Google Hangouts before, so I figured it would be easy to use. We couldn't figure out how to record this session, but we took many screen shots throughout to help document our work. Our group decided to meet at 9:00EST on Saturday. Our family took a mini ski vacation to Boyne Mountain on the weekend, so doing the hangout in the middle of the hotel lobby was somewhat awkward. Another problem we had was getting the meeting to happen. We never were able to reach Amanda. We sent emails and such, but she hadn't responded so she didn't participate in the meeting. I did send her an email after we assigned her a job, but I haven't heard from this email either. We also had a challenge meeting on Google Hangout. Apparently, I was given multiple invitations to the hangout, but it never appeared on my screen. Luckily we shared phone numbers, so we could figure out the issue and finally get myself into the hangout. 2. Eric will create the example and any helpful guides towards the PC side of the project creation. 3. Dan will create the example and any helpful guides towards the Mac side of the project. My example will be screencast using Camtasia. 4. Amanda will provide the research aspect. How will this experience be useful in my first grade classroom? Well it really won't be. It would be challenging to do this with first graders. But I can see utilizing it in different ways. We could do Google Hangouts with other classrooms, similar to using Skype. I'm not sure how it would work, but you could use Google Hangouts, provided to parents, in case they want to mini-conference about an issue. I wouldn't write off the possibility of having 1st graders collaborating in a Hangout. I've done Adobe Connect sessions with 2nd graders, and if you are there to facilitate, it can work. Of course there is a need to practice etiquette and how to use the tools, but especially with a smaller group (4 or less), you can have students take turns talking and using the chat tool. You could share your screen and ask questions. This was for a virtual school, so in a brick-and-mortar school this type of activity might not make sense, but as you mention a Hangout could be good for connecting with another class or a guest speaker.